A 21-year-old Hailey woman has been charged with a felony for allegedly misusing a co-worker's debit card number to transfer money to the telephone accounts of two inmates at the Blaine County jail. One of the inmates has been incarcerated since March for allegedly stabbing the same woman. 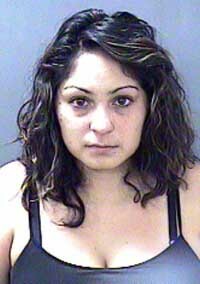 Erika M. Ruiz was arrested by Ketchum police on Friday, Aug. 26, on a felony charge of unauthorized use of a financial transaction card. She made an initial court appearance Monday in Blaine County Magistrate Court and was released from jail later that day after posting $2,500 bond. A preliminary hearing has been scheduled for Sept. 7 before Judge R. Ted Israel. Ruiz is represented by Ketchum attorney Andrew Parnes. Ruiz is a 2008 Wood River High School graduate who court records state has been attending College of Southern Idaho. According to a probable-cause affidavit filed by Ketchum police Sgt. Dave Kassner, an investigation was started at Ruiz's place of employment, the nursery school at Presbyterian Church of the Big Wood on Saddle Road, because of complaints of items being stolen from employees' purses on Wednesday, Aug. 24. Kassner did not report finding evidence linking Ruiz to the stolen items—a small amount of cash, two gift cards and a digital camera—but does allege in the affidavit that Ruiz used a co-worker's D.L. Evans debit card number, without permission, to transfer a total of $65.75 to the jail telephone accounts of two inmates on Aug. 24. Kassner identified the inmates as Alberto Romero-Torres and Ricardo Vargas-Hurtado. He described Romero-Torres as Ruiz's former boyfriend but did not identify a relationship between Ruiz and Vargas-Hurtado. Romero-Torres, 21, has been incarcerated since March on a Blaine County grand jury indictment charging him with felony aggravated battery. He was arrested by Hailey police on March 16 for allegedly stabbing Ruiz in the stomach on March 13 at the couple's home at the Balmoral apartment complex. Vargas-Hurtado, 22, has been incarcerated since June on a Blaine County grand jury indictment charging him with two counts of aiding and abetting delivery of methamphetamine. Both Romero-Torres and Vargas-Hurtado are accused by the federal Immigrations and Customs Enforcement agency of being in the United States illegally.